I know I have another recipe that is super similar to these dragon noodles somewhere on the blog. 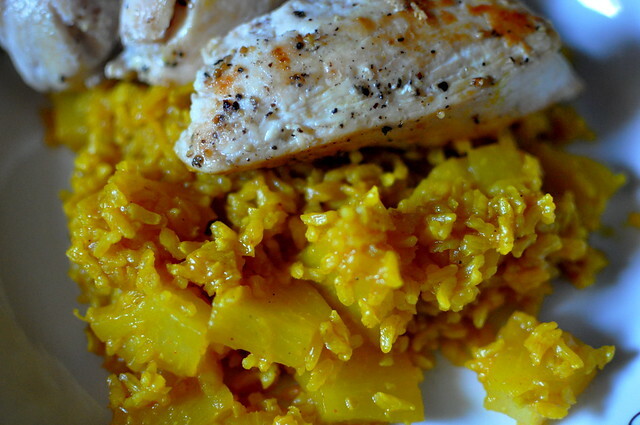 This recipe, and many variations of it, is one of my favorite quick meals to make when it’s just me. Super easy, super delicious, and super hot. Apparently I’m the only one who can handle hot and spicy food in this house. 🙂 This specific recipe is from budget bytes. My only tweak was to use coconut oil instead of butter. I’ve been on quite the coconut oil kick. If you see some at your grocery store, pick it up. You won’t regret it. 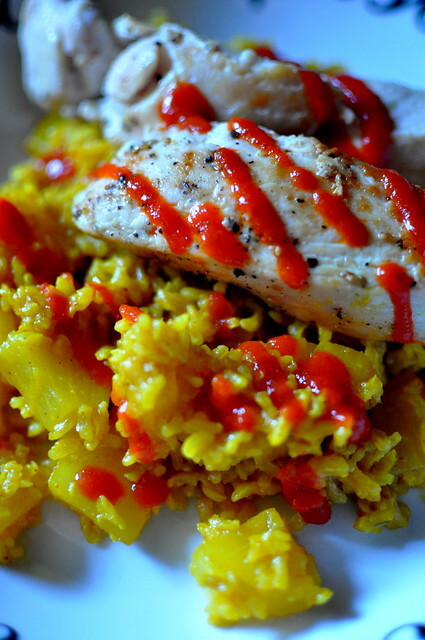 1 tbsp sriracha, or more! 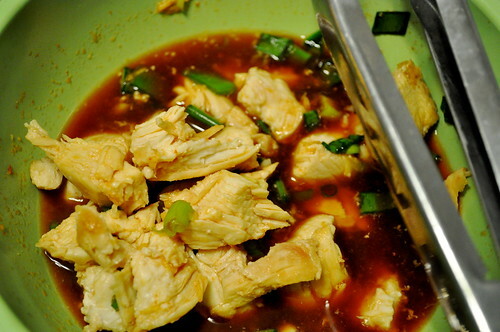 Prepare your sauce while the noodles boil, mixing brown sugar, soy sauce, and sriracha. In a large skillet, melt butter/coconut oil over medium-low heat. Whisk your egg and add to the pan. Stir gently and cook. Turn the heat off when done. Drain the noodles and add to the skillet with the egg, along with the sauce. Turn the heat on low to cook off excess sauce and toss to coat. Serve, topped with cilantro and green onions. The beauty of this recipe is that you can add WHATEVER you want to it. Add some chopped peanuts, sliced chicken, shrimp, pork, more veggies (I added corn in this one). Add in whatever you’d like! Once you try this (or the other variation of this recipe on the blog) I know it will be in heavy rotation for your recipes. yep. EASY! i’ll never forget when julia and mark tried to make pad thai. they used fish sauce and man did it stink. i found a recipe over at Brownies for Dinner for pad thai and had to try it, noticing that fish sauce was nowhere to be found in the ingredient list. i never made pad thai but i was up for this easy challenge. soak noodles according to the package and drain. in a large nonstick skillet, heat oil over medium-high heat. add scallion whites and garlic and cook, stirring constantly, until fragrant. add eggs and cook, scraping skillet with spatula until eggs are almost set. Transfer eggs to a plate. this process takes about a minute, from scallion to egg. add noodles, scallion greens, and sauce to skillet. cook, tossing constantly, until noodles are soft. add egg mixture and toss to coat, breaking eggs up gently. 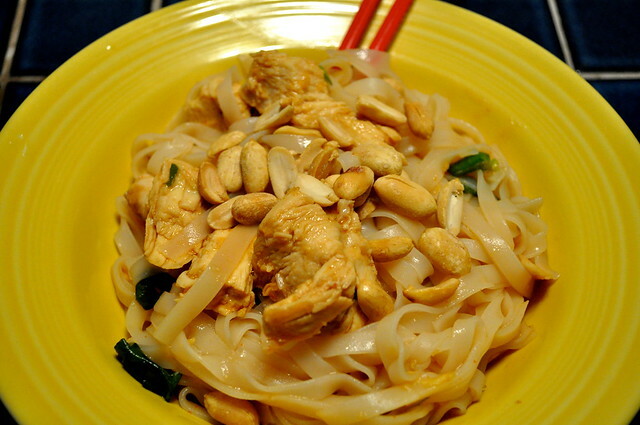 serve noodles with lime wedges, topped with peanuts. besides soaking the noodles, this dish took about 5 minutes to make. it was delicious. now that i have a great pad thai base, i will be making this more often with more things such as chicken, shrimp, tofu, etc. and of course i will post! 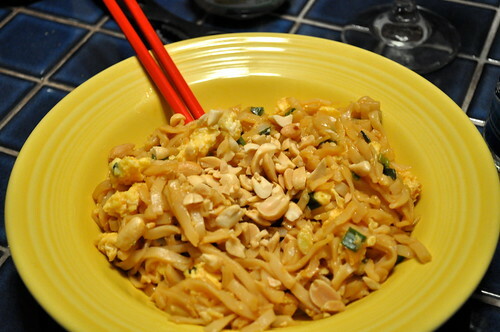 definitely use this recipe if you have ever wanted to make pad thai. it couldn’t be any more simple. enjoy!